(Apricot tree, Almond tree, Cherry, Cherrylaurel, Wild cherry tree, Peach tree, Cherry Plum). Origin: Middle East; introduced into France at the time of Crusades. Habitat: the plum tree does not have particular requirements, although it prefers the cool fields. Hardiness: zone 7 (the Cherry Plum resists well cold until -17 °). Smooth bark slightly cracked reddish-brown-black. Stems sometimes prickly. Deciduous foliage. Leaves (7 cm) oval, shining, glabrous a bit harsh, pointed, toothed and of a dark green. Flowers which appear early and at the same time as leaves; small, in a white - greenish color, grouped in general by two, carried by a downy peduncle. The calyx has fine hairs, even inside. Petals are almost round or elliptical. Flowers attract insects and honeybees which take responsibility for the pollination. It is necessary to plant at least two feet of distinct parents to get the fructification. Fruit: the plum is a drupe of oval or rounded form. It is green in June, then black (variety Holy-julian), yellow (mirabelle) or violet (Damascus varieties and greengages) in July-August. It is covered with pruinose, waxen substance. Inside, the stone is hard, constricted and devoid of furrows; it includes a seed. Maintenance of the fruit trees: see apricot tree. 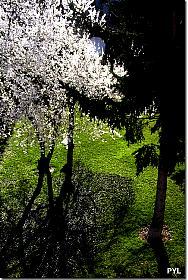 - Mirabelle tree, of Italian "mira bella", "nice to see". It produces very good fruits. - Queen-Claude, of the name of Claude (1499-1524), the Duchess of Brittany, wife of the french king François Ier, who cultivated it in Blois. - Pissardi crimson Cherry Plum: decorative tree with dark crimson foliage, native to Persian, from where it was brought to France in 1880 by the gardener Pissard. Use: the plum is a mouth fruit. It can be preserved in syrup, in jam and in brandy (mirabelle); the Ente plum is dried (prunes). These have laxative properties, due to the fructosanes that they contain. Diseases: among the most important diseases of the Cherry Plum, the Rusty (Tranzschelia pruni-spinosae) makes leaves fall prematurely, Monilioses (Monilia laxa and M. fructigena) is established on flowers and depreciate fruits. The Sharka disease (virus transmitted by aphids) is a serious disease that makes fruit unmarketable and against which we can be protected by using certified seed at planting. Like all fruit trees, plum requires attentive care to prevent pests, aphids, insects, mealybugs.